It all started like this. She showed up on her balcony one day in June 1970. I showed up on her balcony a few minutes later. We haven’t been apart since. Read about theOdysseythat brought us together. Wasn’t she cute? A friend was over one day with his digital camera to shoot some pictures in the basement. We happened to be upstairs debriefing when SWMBO came home. We caught a few shots, all candid, mostly unflattering, but this one is a nice shot. It’s not her prettiest, and I am going to search high and low for a good one to scan and post here, but in the meantime…(do you remember the Home Improvement episode where there was a dinner honoring Jill and Tim was supposed to provide a picture to make a poster for everyone to sign? He waited until the last minute and had them use her driver’s license photo. That subject came up when SWMBO saw this page). Even better, this snapshot was taken at a friend’s wedding (10 November, 2001) and is the best picture of either of us we can recall. I really like this shot. I took it in March, 2004, with our digital camera. Is it any wonder I married her? Now we’re getting somewhere. This may be the best shot of her of all—one which truly shows off how pretty she is. Not that I need to justify anything…This was taken at my 45th high school reunion in ’09. I left my half in there to provide contrast. Due to a combination of circumstances Linda was unable to go to college after high school. For over thirty years I’d been hearing about how she wanted a college education and that she wanted to get a degree to affirm her feelings of self worth. She started taking courses in 1971 at Jacksonville University (Artis Gilmore was still playing basketball there), and went to school on and off for the next 30 years. Finally, on 15 April 2002, Linda received her BSN (Bachelor of Science in Nursing) pin from Florida International University in a ceremony with about 15 classmates. She also won an academic award for scholarship—her GPA at FIU was 4.0. She is very proud of her accomplishment and I am very proud of her. 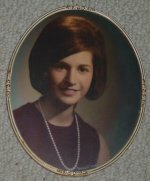 In commemoration of that august event, I now proudly display her picture from High School graduation back in 196…er, something. Speaking of which, in 1988 as the classes of ’63, ’78, and ’83 were contemplating their respective reunions, someone noted that the high school would be 100 years old that year. Someone else had the bright idea that they should hold a mega reunion for everyone who had ever attended. So they did, and it was a grand event with graduates from as far back as 1918 attending. I periodically tell about that event and I preface it by saying, “when we went to Linda’s 100 year high school reunion…” People always get the strangest look on their faces and then Linda hits me. Of course when SWMBO comes home Oreo, our Golden Retriever/Lab mix has to get involved. We had a great run. I miss her a lot. I’ve told people she was the perfect dog. We first saw her when she was five days old and were with her at the end. I’m going to catch a lot of heat for putting the kids after the dog, but hey, I got the dog part done before I did theirs. And when they do their webpage, they can put the cat in front of me. Anyway, here’s some stuff about my daughter,Nicole, and my son,Lee. My parents were the singularly most influential people in my life. I’m sure most parents are that way, but I really feel I had something special with them. Here’s a little something aboutMom and Dad. Taken from the McArthur High School, Class of ’64 Yearbook. Don’t say you weren’t warned.